Today would have been Trina Schart Hyman's 75th birthday. 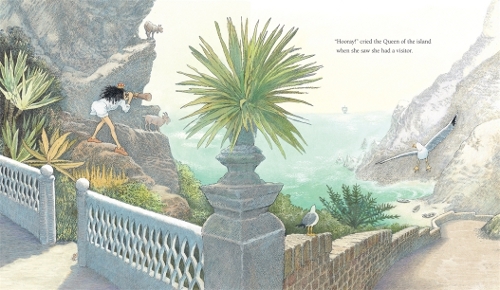 She won the Caldecott Medal in 1985 for Saint George and the Dragon, retold (from Spenser's Faerie Queene) by Margaret Hodges (Little, Brown; 1984; the cover image here is from the 25th anniversary edition, featuring the dragon. TSH did magnificent dragons), and three Honors as well: for Little Red Riding Hood, Hershel and the Hanukkah Goblins, and A Child's Calendar. She illustrated over 150 books, not to mention countless covers (including Ronia, the Robber's Daughter by Astrid Lindgren) and black-and-white interior illustrations. I could go on, but this post isn't meant to be an encyclopedia entry. I simply wanted to say that in my imagination, the landscape of fairy tales is illustrated by Trina Schart Hyman. And thanks to her, that landscape is also peopled by a racially diverse cast of characters. It's a notable quality, especially of her later work, and one that is still too scarce today. I especially like Hutton's own retellings of Greek myths, though; these include Theseus and the Minotaur (my favorite), Perseus, and Persephone, as well as the Homeric stories of The Trojan Horse and Odysseus and the Cyclops. All of these are, sadly, out of print. Hutton himself, who was also a painter and, like his father John, a glass engraver, died in 1994 at the age of 45. I've added his books to my "must buy if I see them at the used book sale" list. They are really lovely. Out of the lands in the chill, far North come legends from long ago. This is the story of Wayland Smith, the strangest of all I know. Those are the opening lines of Wayland: The Tale of the Smith from the Far North, retold by Tony Mitton and illustrated with vinyl engravings by master engraver John Lawrence (David Fickling Books, 2013). Wayland (according to the author's note, which I read using Amazon UK's Look inside! feature) was a legendary smith who took a swan-maiden for a wife. When she leaves him, he dedicates himself to his work, hoping to win her back. Instead, he is captured by a greedy king and imprisoned on a sunless island, where he must hide the treasures he makes in an intricate maze. Ultimately, Wayland makes himself a pair of wings and flies off in search of his wife--and in Mitton's retelling, at least, they are reunited. The cover of Wayland, with its checkerboard pattern of red flames and white feathers, only hints at the boldness and beauty of Lawrence's expressive engravings. Some of them are available to view online at Illustration Cupboard, which held an exhibition of Lawrence's work on this and other books (including Philip Pullman's His Dark Materials and T.H. White's The Once and Future King). And some of those are available for purchase, although I would be happy enough to have only the book.